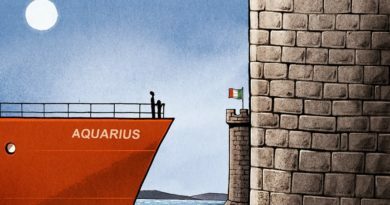 Shortly after the conclusion of the European Union (EU) summit in Brussels on Friday, another tragedy took place in the Mediterranean. According to media reports, a boat with 120 refugees on board sunk off the Libyan coast. Only a few people were rescued and estimates suggest over 100 lost their lives. According to witnesses, large numbers of Moroccan and Yemeni families were on the boat, including babies, women, and children. As a result of the blockading and criminalization of rescue workers, several accidents in the days leading up to the summit saw the drowning of around 220 people. This is a conservative estimate, according to the head of the UN refugee agency UNHCR. According to UN figures, more than 16,346 people have lost their lives since 1 January 2014 (up to 18 June 2018), and since 2000, the death toll is around 35,000. Responsibility for this mass murder lies with the EU and its national governments, which agreed on a dramatic intensification of their anti-refugee policy at the Brussels summit. Plans include hermetically sealing off fortress Europe and deporting refugees en masse to war zones in the Middle East and Africa. “The European Council recalls that the member states must ensure effective control of the EU’s external borders with financial and material support of the EU. Furthermore, it notes that the repatriation of irregular migrants must be significantly increased,” stated the official conclusions from the summit. National measures, including border controls within the EU, are explicitly permitted. “Concerning the situation within the EU, the secondary migration of asylum seekers between member states is threatening the integrity of the common European asylum system and the Schengen legal system. The member states should adopt all necessary internal legal and administrative measures against these migration movements and cooperate closely in so doing,” states point 11 in the agreement. The measures targeting refugees expose the EU as a reactionary monstrosity, which the national governments, their differences notwithstanding, are using to shift European political life sharply to the right. Other sections of the summit agreement include the “strengthening of European defence capacity,” the censorship of the Internet, the expansion of a European police state, and the continuation of austerity policies. Among Salvini’s fascistic proposals were the deportation of “all 600,000” immigrants in Italy and the counting of all the Sinti and Roma living in the country, in preparation for their deportation. 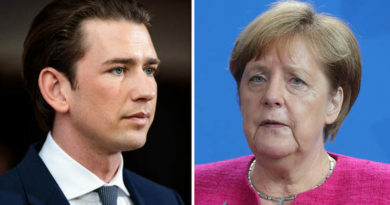 For her part, Merkel praised the summit outcome at a press conference and pointed to the necessity for national measures like those demanded by the CSU. They had “developed a comprehensive immigration strategy, which comprises the external borders and the control of these borders, incorporates external actions, meaning actions outside of the EU, and focuses on the internal issues, what we currently call secondary migration,” she said. The fact that all governing parties in Europe—from the pseudo-left Syriza, to the social democratic PSOE Spanish government, Germany’s grand coalition, and the openly far-right governments in Italy, Austria, and Eastern Europe—are cooperating so closely to intensify the terror against refugees underscores the correctness of the International Committee of the Fourth International’s perspective. To beat back these dangerous political developments, which recall the darkest periods in European history, workers and young people must take up a struggle against all factions of the capitalist class and consciously fight for a socialist programme.